Have you ever wondered whether a trail will meet your individual ability or disability needs? On Sept. 29, from 1-3 pm at Goodwin State Forest, 23 Potter Rd., Hampton, CT, learn about our new trail assessment program using special equipment designed for the High Efficiency Trail Assessment Process (HETAP). 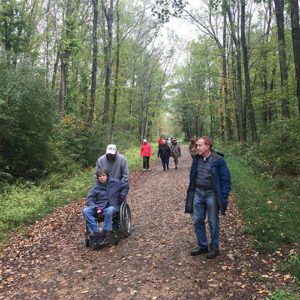 Stroll or roll along the trails of Goodwin State Forest as we demonstrate the equipment and discuss how mobility-challenged users including disabled, elderly and even parents pushing strollers can select trails that will meet their personal interests, skills, abilities and expectations. We will provide signage and information for trail segments already assessed so you can make your own informed decision about what trail to take to get outside and enjoy The Last Green Valley.